NSW’s Sapphire Wind Farm to power 49,000 ACT homes, Canberra Times, Georgina Connery, 27 Apr 17, It is a regional NSW project closer to the Queensland border than to Canberra, but within months the Sapphire Wind Farm will generate power for around 49,000 ACT homes. After a flight to Armidale and long car ride west of Glen Innes, climate change minster Shane Rattenbury toured the facility on Thursday. The wind farm will be NSW’s largest once it is completed. 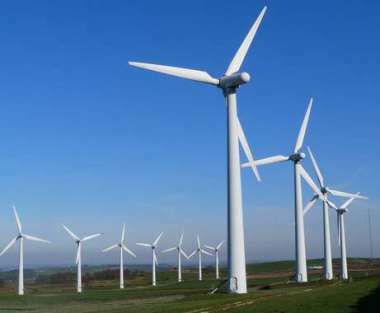 It is owned by CWP Renewables, a joint venture between two European renewable energy companies, and was one of two successful projects in the ACT’s 2015 second wind auction. The farm entered into a 20 year contract to supply 100 megawatts of its 270 megawatt output to the ACT government and by mid next year 32 wind turbines will come online to supply energy for the territory. “Construction commenced in January 2017 on the 100 megawatt Sapphire 1 wind farm, which is another significant step in progress towards the ACT’s 100 per cent renewable energy by 2020 target,” Mr Rattenbury said.